Happy Monday, readers!! I have hardly had time to sit down this weekend, and unfortunately that means I have had no time to write a blog! But, the good news is all that time spent away from the computer translates to better blogs for you :) see, I'm just thinking of you! My blog about the weekend will be split into 2 parts. This is Part I. At church a few weeks ago, I was invited (okay, mass-invited) to some fellow church members' wedding. They hired a charter bus to take a group to their wedding in another province in Korea, to the city of Daegu. Seeing as Korea is about the size of Illinois, this wasn't as big of an issue as, say, going from El Paso, Texas to Jackson, Mississippi. I signed up with visions of white decorations and delicious cake dancing in my head. Well, actually, I knew it would be different, and I mostly just wanted to see the different aspects of a wedding in Korea. 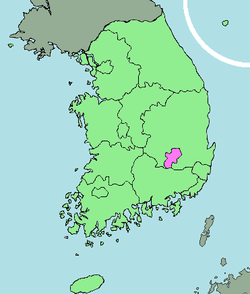 Seoul is on the north-western edge, and the highlighted area is Daegu. Well, the bus was leaving at 8am on Saturday morning, which meant in order to get ready appropriately, and get to the place the bus was at, I had to wake up at 5:30am. My job does not necessitate that I get up by any certain hour (besides maybe noon), so 5:30am is quite early for me. I met with 2 coworkers who I go to church with around 7:20. Both of them had woken up late and we ended up being barely on time for the bus. The bus ride was supposed to be about 2.5 hours, but because of all the traffic it took more like 3 hr 15 min. Which meant, unfortunately, that we were late to the wedding. The happy couple "Mary" and "Peter" (English names) in their traditional Korean attire. We ended up making it into 1 photo, and got to have the buffet/banquet provided. Everyone gave a monetary gift, as is traditional (usually about 30,000W). I'm very glad Michelle told me this Friday at work, or else I would have looked like the 1 jerk who didn't bring a dime. We were there for about an hour, then loaded back up to head home. There was some traffic on the return trip, but we made it back in town by around 4pm. I was glad, because I had planned to do some shopping this weekend. It's getting cold, and I'm not prepared for it footwear wise. I went back to my apartment to change and have some lunch (the buffet provided at the wedding was all Korean food, so I didn't exactly get stuffed). While I was there, I checked my facebook and realized Tab had been trying to contact me. She wanted to know if I wanted to go on a trip to some part of the country to go on a "fall foliage" walk the next day. Initially I felt like I needed sleep, but I decided that it would only be good weather for so long, and I should take advantage. She signed me up, and then I headed back out to go to the shopping district - Myeongdong. I was quite comfortable, but realized when I stepped outside that it was raining; I changed into my wellies and grabbed an umbrella and jacket. Of course, 30 minutes later when I get off the subway, it has completely cleared and it's quite warm. So, I am saddled with heavy rain boots and fleece socks, a jacket, a scarf, and an umbrella. While trying to shop and try on clothes/shoes. Needless to say, not the most enjoyable experience. I was determined though, and came out the other end with a new pair of oxblood jeans (color, not material LOL), a comfy cotton long sleeve from H&M (Mens actually), socks, 2 pairs of leggings, some tights, and some face wash. ... No shoes. I don't understand why it's so hard to find the kind of shoes I want!! Anyway, I went to bed before midnight since I had planned on doing the thing with Tab, which required me to again be up with the sun at 5:30. Overall, the day was interesting, very long, and a little bit disappointing. I had wanted to see the wedding, but instead spent a good 6 hours on a bus, and after 3 hours of shopping, hadn't found what I initially was looking for. Disappointing. I decided that when I get back to America, I am doing some serious wardrobe renovations because I've resigned myself to the fact that I will not be the most fashionable girl in the office, and after a year, I'm going to be sick of that. Good to see you with the Happy Couple! Very nice . . . Know it takes a lot of time, thought and energy, but I (we) really look forward to your blog. Seriously look forward to it! Wow! Nice dress! You look marvelous! PS Your hair is getting long!